Not to be confused with World 6-7. Area 6-7 is the seventh course of Cosmic Adventure and the fifty-second course overall in Mario vs. Donkey Kong: Mini-Land Mayhem!. The level features five Mini Marios, though not exactly in the same starting positions. 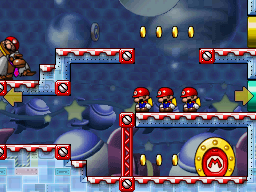 Three Mini Marios begin at the middle right while the other two are immediately abducted by the Capture Kong at the top left, with the exit door at the bottom right. In order to reach it, they must simply be guided via a series of Red Girders and Warp Pipes to some Hammers to take out the Capture Kong, while watching out for the Capture Kong themselves. The M-Token is located at the top center, atop a platform on the upper level. The free Mini Marios must collect it in the same manner as the Mini Mario Card. The Mini Mario Card is located at the top left, right near the azure Warp Pipe entrance. The free Mini Marios must enter the azure Warp Pipe from their starting position to reach it, though the player must make sure that the Capture Kong is dropped down a ledge. In Plus Mode, the Mini Mario must be guided to the exit door first, followed by the Mini Toad, then the Mini Peach, then the Mini Donkey Kong, then finally the Mini Pauline.